In a previous post, I lamented the fact that I had never actually seen a live antlion larva, or doodlebug (family Myrmeleontidae). Lovers of sand, I’ve seen their famous pitfall traps many times, especially in recent years as I’ve searched sand habitats for my beloved tiger beetles. Occasionally, I’ve stopped to jab my knife under a pit, give it a quick flip, and search the freshly turned sand for the maker of the pit – never seeing anything. It never bothered me much either – there were always beetles to catch! Two weeks ago I returned to the sand prairies of southeastern Missouri to look for additional sites for Cicindela scutellaris (festive tiger beetle), and as we searched one particular site on the Sikeston Sand Ridge I once again saw the characteristic funnel-shaped pits amongst sparse vegetation in the sandy soil. I decided this time I needed to give it a good effort – how can any self-respecting entomologist accept not having ever seen a live doodlebug? As I’d done many times before, I kneeled down, gently put the tip of the knife about an inch away from the edge of the pit, and then jabbed its full length assertively into the sand and under the burrow and flipped it over. Like previous times, I studied the turned sand and saw nothing. I stirred the sand gently with the tip of the knife and studied it again – nothing. I tried another burrow – again, nothing. I decided right then and there that I was doing something wrong – I could not simply be picking ’empty’ pits. I continued staring at the turned sand, and then I saw movement – I looked closer, and it seemed as though the sand itself was moving. At last I made out its outline – I had finally succeeded in finding a doodlebug! I dug up another burrow, and knowing what I was looking for this time I had no problem quickly locating the little creature. I watched it as it lay motionless – perfectly camouflaged by its color and with sand grains sticking to its body, and chuckled as it buried itself almost instantly with a quick, backwards shuffle into the sand. Who knows how many doodlebugs I’d successfully dug up in the past, completely overlooking them as they lay disguised and motionless in the sand. More than 100 species of antlions, representing at least 19 genera, live in the Nearctic Region, although much of this diversity occurs in the southwestern U.S. and Mexico. 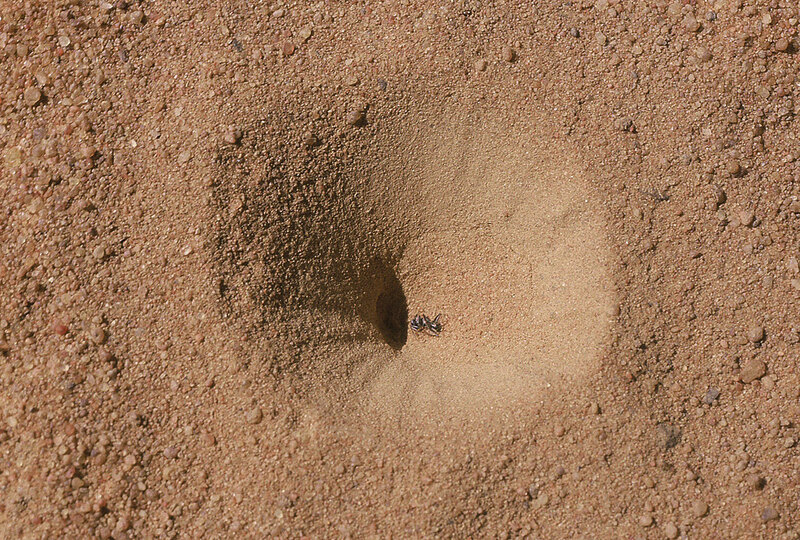 Despite the commonly drawn association between antlions and pitfall traps, in North America only those in the genus Myrmeleon actually exhibit this behavior. This larva dug a pit and so must represent a species of Myrmeleon – perhaps M. immaculatus, a common species in North America and one whose adult I observed last fall on a nearby sand prairie remnant. Species in other genera have free-living larvae that hide under objects or roam underneath the sand, from where emerge briefly to hunt for prey. 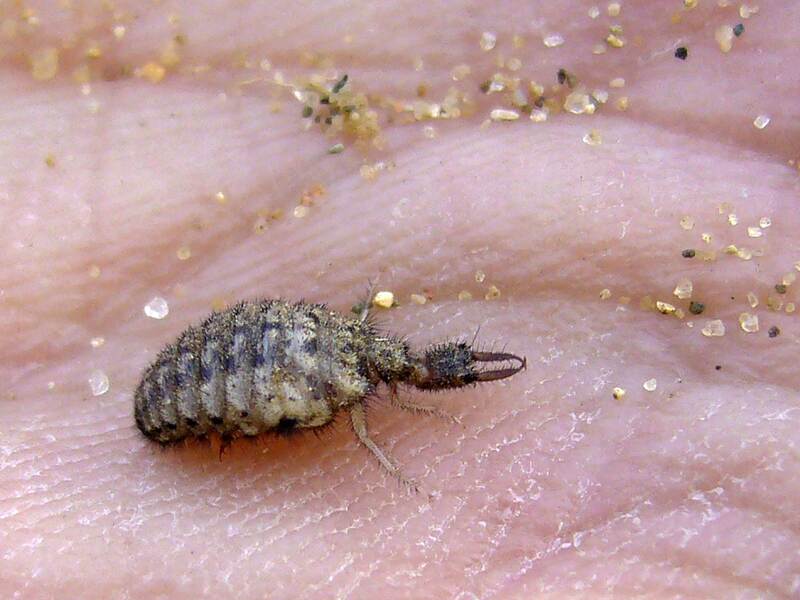 For those interested in learning more about antlions, Mark Swanson has an excellent website called The Antlion Pit. This entry was posted in Myrmeleontidae, Neuroptera and tagged antlions, crypsis, entomology, immatures, insects, Missouri, nature, prairies, predator avoidance, science, techniques. Bookmark the permalink. I grew up in New Mexico and I used the catch these little critters all the time as a kid. The trick was to scoop up a handful of sand that includes the pit. Then let the sand slowly slide between your fingers. If you do it slow enough the antlion won’t fall out with the sand. 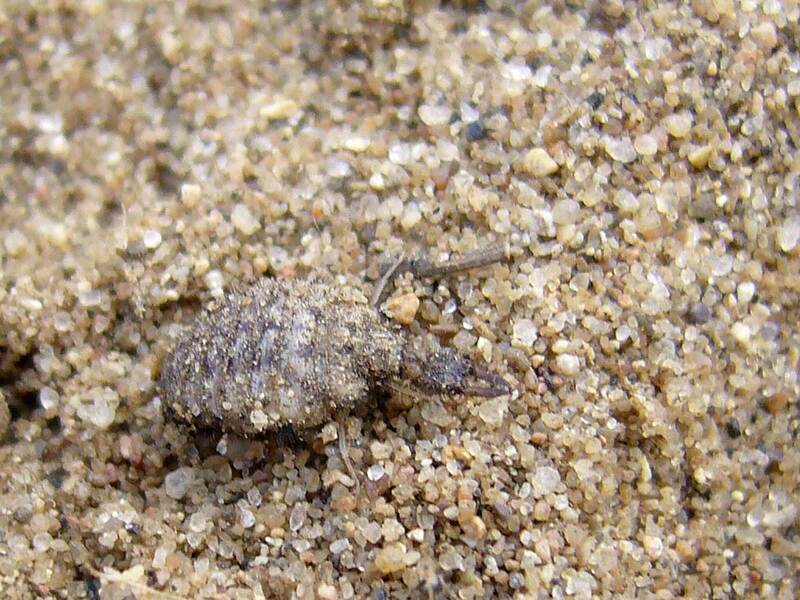 As the amount of sand gets smaller the antlion will try and burrow down deeper and soon you’ll feel him against your hand and know right where he is. Then you can brush away the sand that is covering him and see the little guy in person. I always thought antlions were some of the coolest bugs out there. That’s basically the method recommended on The Antlion Pit as well – or a spoon or small kitchen sieve can also be used. This makes more sense than my “jab and flip” method, which I guess I adapted from its use for extracting tiger beetle larvae from their burrows. Sometimes I can be so myopic! When I was a kid in Kansas I’d find the pits in the fine dirt at the edge of the foundation or our house in Kansas City. I used the spoon and hand technique, but put the dirt on the palm of the hand and gently shook it from side to side, spreading the dirt out. As it thinned, the ant lion would be exposed and you could feel it attempting to dig deeper into your hand. It seems everyone had this figured out before me. I had an urban childhood, so I never even saw an antlion pit until I was an adult (and already focused on beetles). Of course, all of these techniques rely upon using pitfall traps to locate the buggers to begin with. I’d sure like to find some larvae in other genera that don’t make pits – I can imagine trying to find any of them is a real challenge. I my post, “Lions in South Africa,” I featured the adult of Palpares lentus, one of the true giants of the family that lives in Africa’s dry, tropical bushveld. With an adult wingspan exceeding 6 inches, I can imagine the larva of that species is a spectacularly impressive beast! Good story, Ted. I’m on the list of people who haven’t seen an antlion before. Maybe my time is now to see one. Waiting is the operative word! The larvae are very cryptic! I have raised in a petri dish! A 1/2 inch of sand and watch these buggers move under the surface-absolutely amazing. Feed crickets and /or meal worms or ants! Another testimonial to Biodiversity and exploiting a niche all in one photo! My goodness- I’ve never seen one either. How many little empty funnels do we accept in life without really thinking about it?! 🙂 Thanks. You’re welcome, Beau. It’s amazing what is out there if only we look. Hi Joan. Yes, it’s the sand clinging to it that really disguises it – the photo was taken after I “brushed” it a little with the knife tip to get some of the sand off. If rearing one of these guys is half as much fun as the tiger beetles I’m rearing, it would be worth the while.